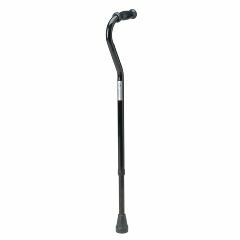 This single point bariatric cane has all steel construction with dual-tubing insert for added strength and security. Weight capacity: 500 lbs. (227 kg). Adjustment height: 29 - 38" (74 - 96.5 cm). Cane weight: 3 lbs. (1 kg). AllegroMedical.com presents The Offset Handle Bariatric Cane. This single point bariatric cane has all steel construction with dual-tubing insert for added strength and security. Single point design gives additional balance support and weight-bearing capabilities. Weight capacity: 500 lbs. (227 kg). Adjustment height: 29 - 38" (74 - 96.5 cm). Cane weight: 3 lbs. (1 kg).